Umbria's prized lentils from Castelluccio are tiny brown jewels with a delicate flavour and wonderfully tender texture. 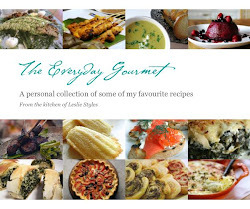 Like Puy lentils, they don’t disintegrate when cooked, which makes them ideal for salads. You can get them from Italian or gourmet markets, or as we did, brought them back from the source — Norcia in southern Umbria. This substantial dish, created by Yotam Ottolenghi, is best eaten at room temperature, and can be served on its own or with steamed seasonal greens such as broccolini or baby fennel. One of the gems of Umbrian cuisine, these lenticchie di Castellucchio have been tossed with vinegar, onion, salt, pepper, garlic and oil when they're warm, so that they soak up all of the fabulous flavours. Gorgonzola, lots of herbs and dried tomatoes are mixed in at the end. The result, a big bang of robust flavours by the one and only, Yotam Ottlenghi from his newest cookbook 'Plenty'. Preheat the oven to 275°F. To make the oven-dried tomatoes, start by quartering the tomatoes vertically and place them skin-side down on a baking sheet lined with parchment paper. Arrange the thyme sprigs on top of them, then drizzle over the olive oil and balsamic vinegar and sprinkle with some salt. Roast for 1 1/2 hours, or until the tomatoes are semi-dried. Discard the thyme and allow the oven-dried tomatoes to cool down slightly. Meanwhile, place the red onion in a medium bowl, pour over the vinegar and sprinkle with the sea salt. Stir, then leave for a few minutes so the onion softens a bit. Place the lentils in a pan of boiling water, so that it comes 1 1/4 inches above the lentils, and cook for 20 to 30 minutes, or until tender. Drain well in a sieve and, while still warm, add to the sliced onion. Also add the olive oil, garlic and some black pepper. Stir to mix and leave aside to cool down. Once cool, add the herbs and gently mix together. Taste and adjust the seasoning. 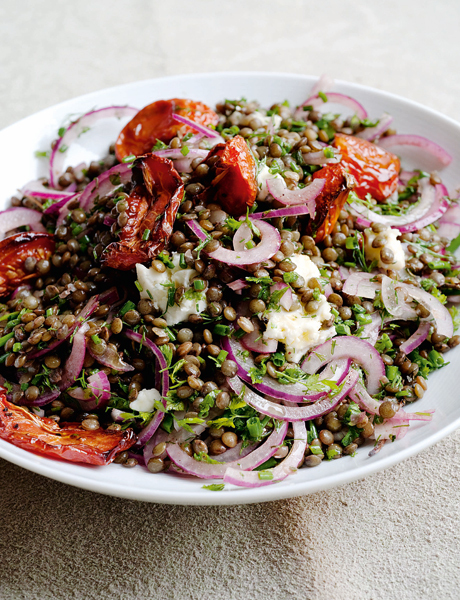 To serve, pile up the lentils on a large plate or bowl, combine the Gorgonzola and tomatoes as you build up the pile. Drizzle the tomato cooking juices on top and serve.